The annual Highland Golf Links 54-hole Pro-Am sponsored by Blue Group was held this week at Castle Stuart Golf Links, Nairn Golf Club and the Championship Course at Royal Dornoch Golf Club. Nearly 300 players from across the UK, as well as from Sweden, Germany, Holland and the USA, took part in the tournament which was sponsored for the third successive year by Blue Group. The event culminated at a prizegiving dinner at the Kingsmills Hotel in Inverness last night (wed). The Kingsmills, along with Culloden House in Inverness and the three golf courses, are members of Highland Golf Links (HGL) which promotes play and stay golfing breaks in the north of Scotland. 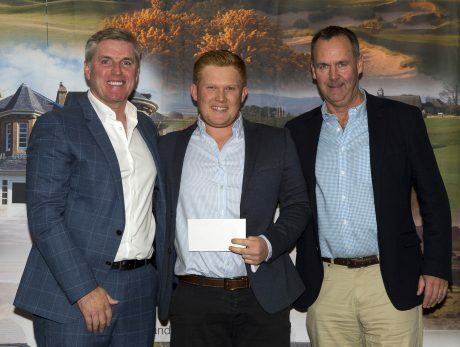 Leading professional winner was Chris Lloyd, from the Kendleshire Golf Cub, near Bristol, whose score of 205 was one ahead of Tom Higson, from Gleneagles and Steven O’Hara, from North Lanarkshire Leisure. Team winners were Glasgow Whisky2 (265 points) with Team Rambo runners-up. Among the highlights of the event were two holes in one, scored by pros Ben Craggs, at Castle Stuart’s Par 3 11th, while playing with the Corr & Corr team, and Craig Lawrie – son of former Open champion Paul – at the Par 3 2nd at Royal Dornoch, playing with the Touch Systems team. The Pro-Am is estimated to generate about £300,000 for the Highland economy, with HGL partners and other businesses in the area all benefiting from late-season business. The event raised £1,740 for charity which will be donated to The Oxygen Works, created by the MS Therapy Centre, in Inverness, which provides a range of treatments – including oxygen therapy, physiotherapy and massage and reflexology – to help people with a number of medical conditions, including multiple sclerosis, cancer, Parkinson’s and diabetes, as well as sports injuries. 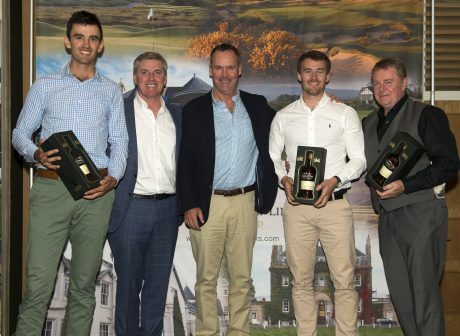 Stuart McColm, general manager of Caste Stuart Golf Link who presented the prizes on behalf of Highland Golf Links, said: “The Pro-Am was once again a hugely successful event. The influx of golfers at this time of year generates very welcome income for the area and we are delighted also to be able to support a very important local charity. The Pro-Am, which boasts a professional prize fund of more than £40,000, is open to teams of four players from anywhere in the world consisting of three amateurs (ladies or gentlemen) plus a professional of their choice. Teams that do not include a pro are allocated a leading player from the PGA Scotland Order of Merit.